Ligaya F. Amilbangsa with some members of the AlunAlun Dance Circle. Photo taken from the Eid’l Fitr 2014 performance at SM The Block. In a time that has seen nations violently torn apart by ethnic and religious wars, it is important to be reminded of the healing power of the arts in showing that while culture is what makes people of various ethnicities, religions, and nationalities distinct, it is also culture that connects them in the awareness of a shared humanity that is enriched by such differences. This truth lies at the heart of the lifework of Ligaya Fernando-Amilbangsa. Born to a prominent Catholic family in Marikina, Metro Manila, Fernando-Amilbangsa had always loved dance and the arts. A turning point in her life came when she married a schoolmate and moved to his home in Sulu where, in the next three decades, she immersed herself in the rich cultural life of the Muslim South. In the midst of the region’s secessionist and insurgent conflicts, she turned her love for the arts into a vocation as cultural researcher, educator, artist and advocate of the indigenous arts of the southern Philippines, particularly the Sulu Archipelago. Her signature involvement has been the study, conservation, practice and promotion of the dance style called pangalay (“gift offering,” or “temple of dance” in Sanskrit), a pre-Islamic dance tradition among the Samal, Badjao, Jama Mapun, and Tausug peoples of the provinces of Sulu and Tawi-Tawi. A highly intricate and expressive dance of many variations, traditionally performed in weddings and other festive events, pangalay has the richest movement vocabulary of all ethnic dances in the Philippines and is the country’s living link to the ancient, classical dance traditions elsewhere in Southeast Asia. Fascinated by its beauty and recognizing its importance in the cultural heritage of the Sulu Archipelago and the entire Filipino nation, she was saddened to see that pangalay was becoming a marginalized tradition. Thus she committed her life to patiently documenting the dance and its allied expressions; teaching the dance using a method she personally developed, promoting it by choreographing and organizing performances, and making it known to the world through her lectures, performances, and writings on pangalay and the visual arts of the Sulu Archipelago. Working mainly in an individual capacity and using her own personal resources, she inspired the formation of performing arts groups, networked with dance scholars and practitioners in Asia, and presented both traditional and innovative pangalay choreographies in and outside the country. Moving back to Metro Manila in 1999, she formed the AlunAlun Dance Circle (ADC) and lent her own home for a dance studio—to study, teach, and perform pangalay and other traditional dance forms. The group has since done hundreds of performances and workshops throughout the country. 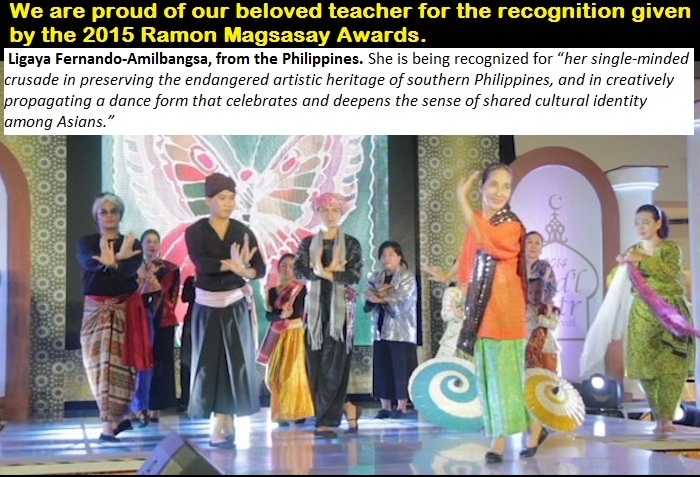 In electing Ligaya Fernando-Amilbangsa to receive the 2015 Ramon Magsaysay Award, the board of trustees recognizes her single-minded crusade in preserving the endangered artistic heritage of southern Philippines, and in creatively propagating a dance form that celebrates and deepens the sense of shared cultural identity among Asians.